The Super Nintendo Entertainment System (abbreviated as SNES and Super NES or commonly Super Nintendo) is a 16-bit video game console created by Nintendo. It is the successor to the original Nintendo Entertainment System and Famicom and Nintendo's entry into the 16-bit era, primarily competing with Sega's Mega Drive/Genesis console. The system was originally released in Japan on November 21, 1990, as the Super Famicom. The Super Nintendo Entertainment System was released in America on August 13, 1991, and later in Europe in April, 1991 and in Australia in July, 1991. 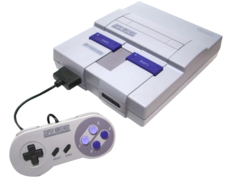 The SNES was released in South Korea as the Super Comboy by Hyundai Electronics, due to the country's embargo on Japanese products at the time. Unlike the Comboy, which was a rebranded American NES, the Super Comboy was a rebranded European/Japanese SNES. Despite its later release compared to its competitors and significantly lower sales than the original Famicom / NES, the Super Nintendo Entertainment System was the best-selling console of its time, selling over 49 million units worldwide in its lifespan (outselling Sega's console by around 19 million unis). The console was discontinued in Europe and North America in 1999, while in Japan the console continued production until September 2003. The SNES was followed by the Nintendo 64 in 1996. ↑ Nintendo to end Famicom and Super Famicom production. GameSpot (May 10, 2003). Retrieved December 5, 2016. ↑ Hardware and Software Sales Units. Nintendo. Retrieved December 5, 2016. ↑ 3.0 3.1 Consolidated Sales Transition By Region. Nintendo (October 26, 2016). Retrieved December 5, 2016.